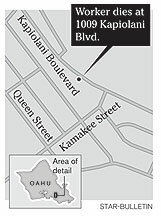 Police inspected the concrete pump that struck and killed a worker yesterday at the construction site at 1009 Kapiolani Blvd., near the Blaisdell Center. A 50-year-old construction worker died yesterday after a concrete pump fell and slammed into his head at a luxury condominium project in Kakaako. The accident occurred at about 11 a.m. at the Moana Vista, 1009 Kapiolani Blvd., when the strap attached to a crane got tangled up with a concrete pump, police said. The strap snapped, dropping the pump, which then fell onto the man, who was on the ground. A colleague, Kawika Leopoldo, said the man was Greg Wong, a respected and dedicated worker for American Standard Concrete Pumping Hawaii Inc. The company's president called him one of the best employees. A state agency is investigating the death of a construction worker yesterday after a concrete pump slammed into him, marking the fifth in a rash of fatalities on construction sites in Hawaii since October. 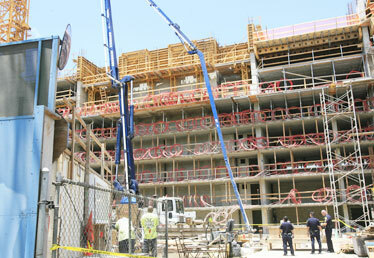 A 50-year-old man was killed in a tragic construction mishap at the Moana Vistas. A 50-year-old man, identified by colleagues as longtime concrete pump worker Greg Wong, was working with a concrete boom pump at the upcoming condominium project Moana Vista at 1009 Kapiolani Blvd. when the pump fell and struck him on the head at about 11 a.m. According to the state Department of Labor and Industrial Relations, a construction crane on the site was bringing materials down from the seventh floor of the unfinished building. The crane was escalating again to pick up materials when the sling snagged the concrete pump, which was nearby. 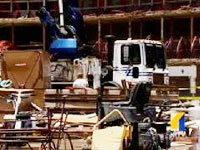 Police investigating the scene said workers told them some yelled, "Watch out!" after the sling snapped, prompting the concrete boom pump to swing into Wong, who was working on the ground. Wong had massive trauma and was taken in critical condition to Straub Clinic & Hospital, where he was pronounced dead at 12:07 p.m., according to Honolulu Emergency Services spokesman Bryan Cheplic. James Hardway, spokesman for the state Labor Department, which investigates construction accidents, said workers told investigators wind might have been a factor in blowing the sling toward the concrete pump. The state Occupational Safety and Health Division has six weeks to investigate the accident and up to six months to issue a report and any citations. Since October, the start of the department's fiscal year, there have been five deaths on constructions sites in Hawaii. In one of the more publicized and bizarre deaths, construction worker Pauu Pooi died in December after falling 30 feet into a cesspool in Laie. Hardway said there does not seem to be a pattern in the cause of the accidents. "No one wants to have any fatalities on a job," Hardway said, noting that there have been steady decreases in injuries and illnesses among construction workers since 2002. "We have had an issue with fatalities recently, but if you look at the fatalities, there doesn't seem to be one commonality in between them." Hardway said yesterday's accident was the first time a construction worker had died because of a concrete pump getting tangled with a construction crane sling. The general contractor for Moana Vista is Hawaiian Dredging Construction Co., though Wong was working for American Standard Concrete Pumping Hawaii Inc.
Police surveyed the construction site yesterday at 1009 Kapiolani Blvd., where a worker was killed. 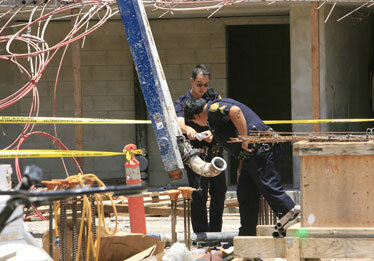 A long concrete pump, visible in the center background, fell and killed 50-year-old Greg Wong. Company President Gregory Perrin called Wong one of his best employees and offered his condolences to his family. One of Wong's longtime co-workers, Kawika Leopoldo, stopped by the site after the accident to pay his respects. He said Wong, an experienced worker, was a family man who had brought three of his sons at one time to work with him. "He was always very helpful. He was a great, loving dad. Braddah Wong, we'll miss you," Leopoldo said, looking up at the sky.